Or, if your name is Hayley and you grew up being babysat by Little Debbie and Hostess’ biggest fan, every-day snack food. You know the usual suspects: Twinkies, Nutty Bars, Oatmeal Creme Pies… Those guys. Yeah, it’s no big shocker here that I love me some snack cakes, hand pies and convenience-store fare. I grew up on the stuff, ate it constantly, and despite the shocking calorie stats, can’t typically resist all that sugar. But can you believe I’ve only had a moon pie ONCE?? Yes, people. ONCE. It’s kinda sorta ridic. A long time ago, I dated this boy who was like, stupidly-obsessed with weird heavy metal music and I don’t think he owned any clothing that wasn’t emblazoned with the Spitfire logo. Anyway, his family was from the South and one time, he traveled down there for a week (which, for a 14-year old girl was like, a friggin’ eternity). When he returned, he introduced me to Moon Pies. 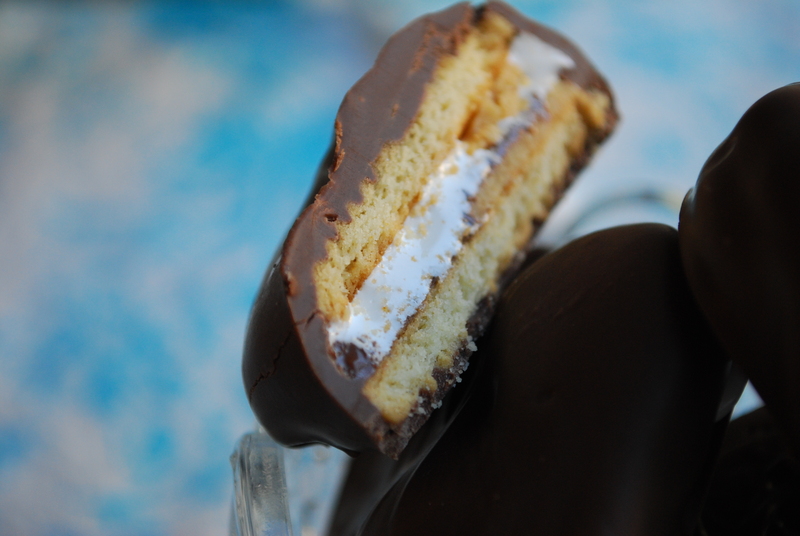 Moon pies are basically graham cracker cookies snuggling a thick layer of marshmallow, then dunked in chocolate. They’re a delicious classic and I’ve liked ’em since I tried them. However, I wanted to recreate them my way with my crazy Hayley twist. That means, taking a Golden Oreo (my fave), opening it up, and shmearing on peanut butter, marshmallow fluff and Nutella. Then I closed it up, froze it for a beat, and dunked the whole thing in chocolate. 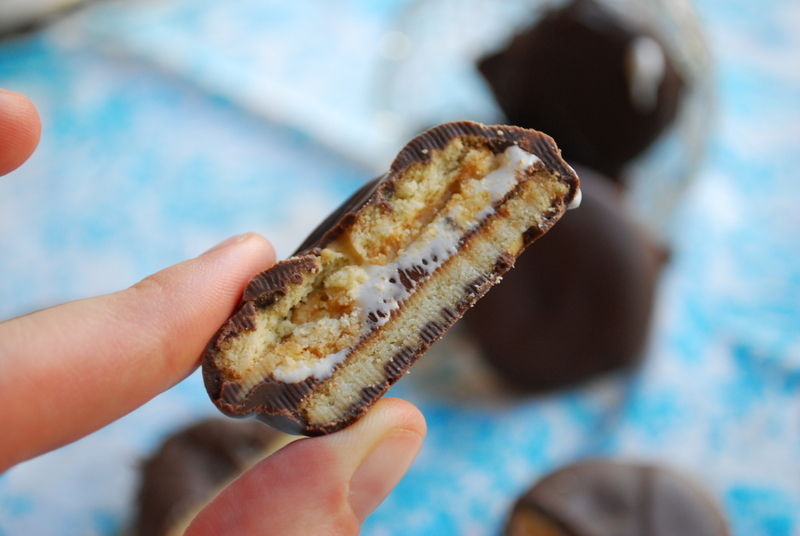 No surprises here: it is ridiculously gooey, crunchy, sweet, and has lots of classic flavors going on that, when combined into a petite faux-moon pie, taste simply heavenly. Plus, it’s no-bake, so if you’re still struggling with (disgusting) 100 degree days and the thought of putting on a scarf sounds about as appealing as eating a scarf, this recipe is for you! 1. Line a baking sheet with foil and set aside. Gently twist the Oreos open and line them up on the sheet, side by side. 2. Smear about 1/4 tsp each of peanut butter, marshmallow fluff and Nutella on one side of each cookie sandwich. Repeat until all cookies have the three fillings. 3. Re-“sandwich” the Oreos and freeze for about 30 minutes or until firm. Meanwhile, prepare the almond bark according to package directions. 4. Using a fork, gently submerge the sandwiches in the melted chocolate to coat, allowing excess to drip off. Once all pies are coated, freeze again to harden the chocolate, about 20 minutes. Store leftovers airtight, at room temperature 2-3 days or in the freezer, about 1 week. My dad (who wasn’t a huge moon pie fan) really enjoyed these mini moon pies, and I found them particularly delicious crumbled on an ice cream sundae… just sayin’. Twinkies, Nutty Bars, Oatmeal Creme Pies are some of my childhood faves! Although I do like Moon Pies, I didnt discover them til I was much older…whereas OCPies, I could take down half a box after basketball practice as a kid. Same with Twinkies. Great job on these! Ugh, same. Oatmeal Creme Pies are just too easy to take down! This is a genius idea!!! I haven’t eaten a lot of moon pies, but I think I could manage to consume a few (hundred) of these! I used to love Zingers. I’d peel the frosting off first! I once ate a whole box of Twinkies. Then barfed up the whole box. Haven’t been near one since! 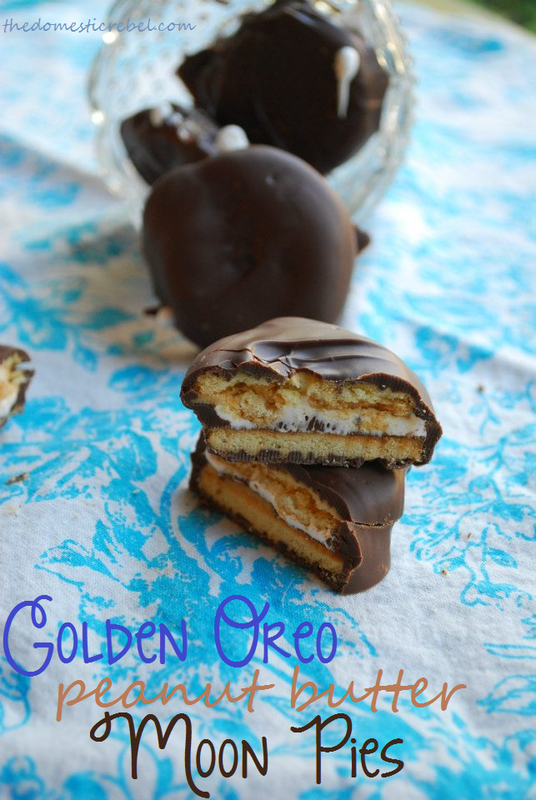 This is the perfect use for golden oreos! Ahahahahahahah I love your Twinkies story, girl! So funny. That’s how my brother is with the pink circus animal cookies. I’m going to make these for my mom. She loves Moon Pies but they are always too big for her. So these mini-moon pies will be great. AND, I get to introduce her to my newest obsession – Nutella. Golden oreos are our favorites too! Nutella–let me count the ways! So amazing. I’m sure your mom will love these, Kelli! You’re like a mad genius! Amazing. Oh, yes. Yes, yes, yes. 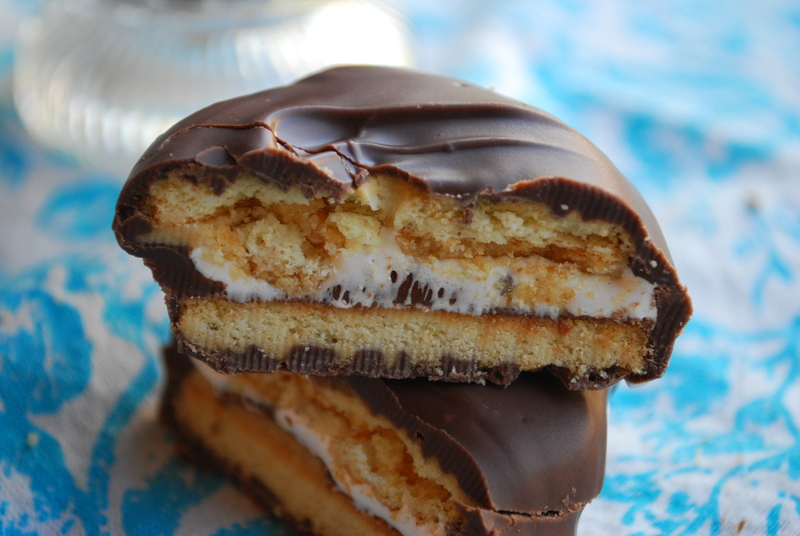 I’ve only ever had Moon Pies a few times…but I could eat these all day, every day. I think Golden Oreos were sent here from Angels. I’m such a goober. I have yet to have a Golden Oreo. My kid has issues with food that doesn’t look like what they are supposed to. Basic Oreos in this house only! Those Moon pies do look yummy. Whaaaaa?! OH EM GEE, Karyn, you’re definitely missing out! Secretly buy a bag and hide it–because once they find it, it’s OVER for regular Oreos. I’m serious. Golden ones are the bees knees! I bet I couldn’t eat just one of these! Great idea! This is brilliant, Hayley! I would need to make a large batch of these so that they would last more than a day! you are a freakin genius. That is all. oh, and we should totally stuff these in our purses when we go shopping together. we will need the sugar fuel for all the damage we will do! woah girl, this is out of this world!! this is a brilliant idea and something that needs to happen in my own kitchen! Um, yeah. McDonald’s and Little Debbie Snack Cakes. That’s totally what I was raised on 🙂 And this is one girl who LOVES her moon pies! This recipe is frickin’ awesome! Wow, these are pure genius!! I’m having a huge craving for these now and I haven’t even had them yet.